Finding the right pair of jeans when shopping is never easy. Many people, especially women, have a problem when it comes to fit. Often, a pair of jeans will fit the legs and thighs perfectly, but then feel too tight in the buttocks and sometimes huge in the waist. 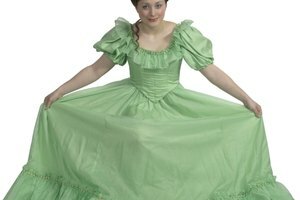 There's also the issue of the garment being too long for petites. Low rise jeans are certainly no exception to these frustrations. You can solve these problems by making your own low rise jeans. Put on a pair of old high-waist jeans. Mark an area at the waist where you would like to shorten them. Use a pen or chalk to do this. Use a tape measure to measure the waistband from across the marking you made. Also measure the entire waistband itself and add 5/8 of an inch to the measurement. This will be the cutting line. 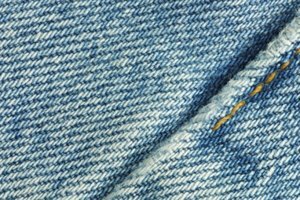 Examine the front and back pockets of your jeans to ensure that they are not above the cutting line. If any are, remove them from at the seams using a good, sharp pair of scissors. Remove all of the stitching and put the pockets aside for later. Using the sharp scissors, remove the stitching from the waistband to remove it. Put the waistband aside in the meantime, as you will need it for further use later. Cut away at the material at the cutting line with dressmaker's shears or the sharp scissors. Fold a 5/8-inch portion of material at the new waistline inside and pin them all the way around with some pins to keep the material in place. Stitch new seams into your removed original waistband so that they coincide with the new measurement you made for the cutting line of your jeans. If necessary, use some of the excess material you previously cut away to lengthen the waistband. 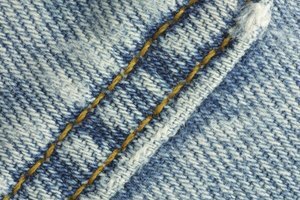 Lower the zipper to about an inch below the new hem at the top of the jeans. Make some stitches over the metal teeth until you have a lump of stitching at the top on either side of the fly. This will prevent you from pulling the zipper further as it only goes as far as the one-inch at the hem. Stitch the pockets you removed earlier back onto the jeans. You can do this by hand using a needle and thread or by using a sewing machine if you have experience using one. Unfold the flap at the top of the jeans, at the waist, and pull down the zipper. Pin the waistband to the top of the jeans. Afterward, turn the jeans inside out and sew the waistband back on the garment at the new cutting line area. Take out all the pins, lift the seam and iron it flat with a hot iron on an ironing board. Fold the waistband back into position when you're done. Try on the jeans and take a look at them in a full-length mirror. You may want to completely replace your zipper with a shorter one. Ask for help from a family member if you don't have much experience using a sewing machine.